These are comforting, like all dumplings, but they’re not stodgy in the least! They’re light and crispy, with a soft, pleasing center. They also have a nice hollow in the middle that you can fill with the goodies from your stew. 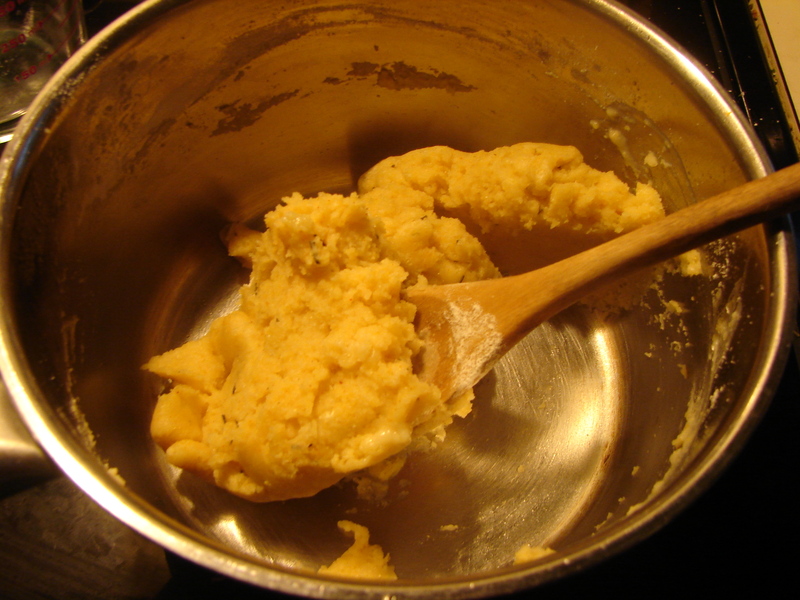 The dough is based on choux pastry, with a bit of cornmeal and herbs added for extra deliciousness. These are baked instead of simmered in your stew, so that they come to the table fresh and crispy and ready to sop up delicious broth. They’re also really easy to make! 1. Put the water in a saucepan over high heat. Add the butter, cut in pieces, and bring to a boil. 2. Combine the flour, cornmeal, and all the spices. 3. When the water is boiling, take it off the heat and stir in the flour all at once, till it forms a ball. 3a. Beat in the eggs one at a time until completely smooth. 4. Drop by tablespoonfuls onto a lightly greased sheet. 5. 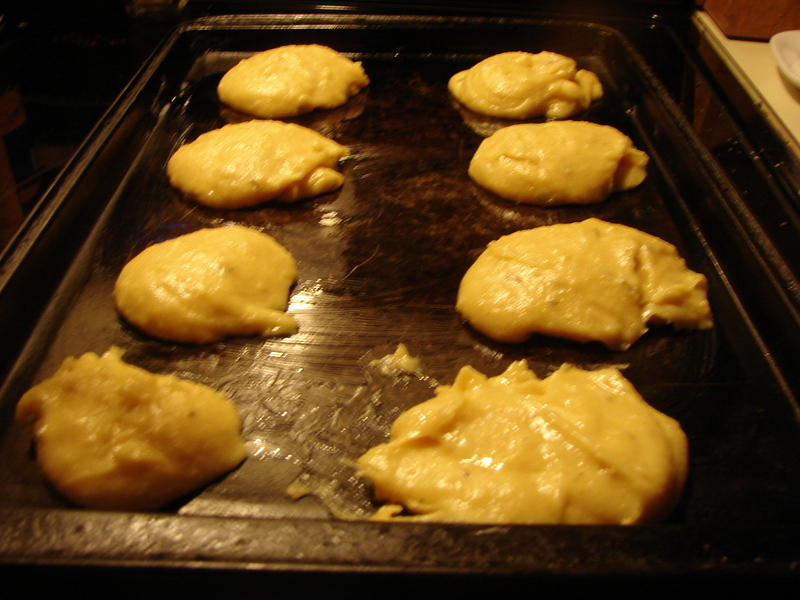 Cook in a preheated 425 degree oven for about 20 minutes, till they’re golden and crispy. Eat! You can serve them with a stew, or you can fill them with any delicious thing – tapenade, or soft cheese, or tomatoes and basil…anything you like! 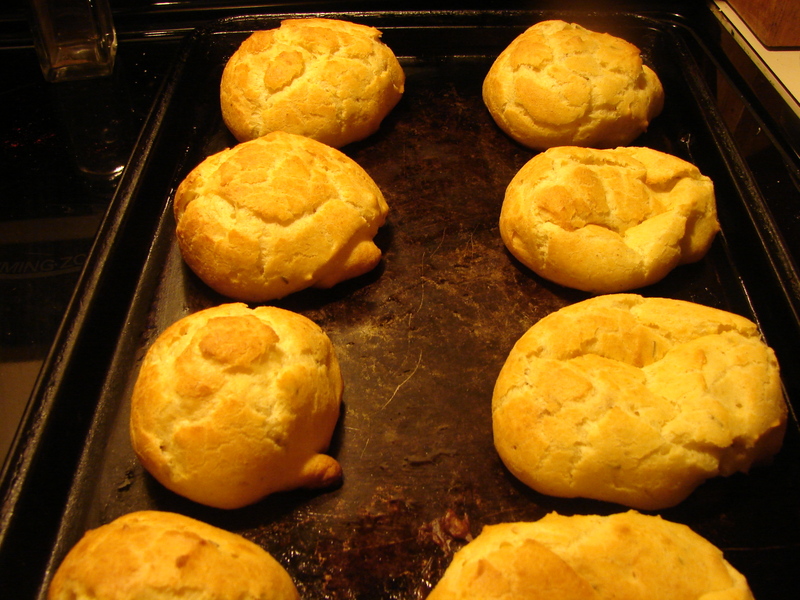 This entry was posted in recipe and tagged baked cornmeal dumpling, herbed dumpling, savory choux pastry by Claire. Bookmark the permalink. Yes, I’m fairly sure corn meal it polenta. I do have a kitchen scale, for the measurements, but I get very confused when I try to translate from one unit of measurement to another! So I’m just sticking with cups and etc. for now. I could work on a translated version if there’s anything in particular you’d like to try! Cornmeal is the same grain as polenta but a very fine grind, almost like flour. Make sure you don’t use a coarse polenta (even thought that is best for grilled polenta slices). This looks delicious!!!! Thanks for your comments about our Cheese puffs in the NY Times. Will try to make this recipe to eat at home. Thanks for commenting! I’m so fascinated by the Brazilian cheese puffs! I found tapioca flour at the grocery store – I’ll be trying this soon. I’d love to talk more about Brazilian food. I find it so interesting. I’m curious if there’s any sort of vegetarian food culture in Brazil? Hope this isn’t a rude question. Those 3 eggs (from the list of ingredients) are not mentioned in recipe instructions. Do I stir them to the hot mixture? Shall I beat them before… or what is the exact procedure? That’s a huge mistake! I’m so sorry and thanks for pointing it out. You beat them into the batter, one at a time, until smooth. I’ll fix it now!